Honestly, I do. You think you’ve seen everything and you think that everything makes sense. You think that, then your closer enters the game with a four run lead. You go to the kitchen to grab a drink. You say, “Ahh, nothing like a Mets ‘W’ to start off a series. Neigh, to start a weekend! Oh, the Nationals lost tonight? Even better!” You do this because your closer is starting off the top of the 9th with a four-run lead. That type of lead has to be safe. All he has to do is record more outs than runs allowed—there’s even a one run buffer to that statement. This game is in the bag. It has to be. They have the game in the palm of their hand, and just to be safe they sent their relief ace to further demoralize the opposition. Simple rational thought pegged this game to be over. It was simple. It just made sense. Then a stray though crosses your mind. “Ha, I wonder if this makes too much sense.” No, that can’t be. You’re just being pessimistic. And then Adrian Gonzalez singles to left field. You start to worry a little, but that is easily quelled. It is quelled because it is still a four-run game in an environment that just needs three outs to end the game. What’s one little base runner going to hurt? Especially when it’s Adrian Gonzalez. He’s not known for his speed. He’ll fit nicely into this impending double play! And the guy coming to the plate is Howie Kendrick? Oh, there’s nothing to worry about. He has hit into 39 double plays since 2014, and is tied for 3rd in the National League in most double plays grounded into (as if this were some incredibly important quality). Also, you saw that Twitter said he was checking his phone earlier—clearly his head isn’t in the game! Well, I mean it was probably just a sheet of paper telling him where to stand for shifting purposes and was blown entirely out of proportion…but still! And then Kendrick sends a swinging bunt down the third base line that David Wright decides he has no play on. OK, now worrying is a little is justified. But it’s cool, because the lead is still there. No need to freak out. Be cool. It’s just a baseball game, right? And then Jeurys Familia strikes out Joc Pederson. You lean back, kick your legs up on that well-placed ottoman. One down, two to go. You knew they had it all along, they just had to make it interesting. Then it gets interesting. Murphy’s Law – If anything can go wrong, it will. A Yasiel Puig single into left field loads the bases, and is then followed up by a Yasmani Grandal walk that brings one run home. Now the score is 5-2. Oh no. The tying run is on first now. This is most frightening. You can slowly feel grief start to form. You look for positives like someone who just fell off of a cliff and is grasping out for a branch to hold onto. Perfectly timed, you find one to grab. Due up next? The pitcher’s spot. Of course a reliever isn’t going to hit, so the Dodgers send Trayce Thompson to the plate, who promptly returns to the dugout with a strikeout. Two outs. One out to go. Just one. One. With a chorus of boos accompanying him on his way to the plate, Chase Utley was that one remaining out. Oh the chance for sweet redemption was present. He stepped to the plate, and retribution-hungry Mets fans smelled blood. The story was perfect. As opposed to hitting him, the Mets would set him down to end the Dodgers comeback. “Yeah, that has to be why this happened,” you reason, although it might resemble something closer to a plead. It’s all a part of baseball’s big giant plan. And then Utley lined a ball into the right center gap—scoring three runs to tie the game. This would be where you enter the ‘anger’ stage of grief. As if Mets fans needed another reason to hate him, Utley ties the game with a base-clearing double. You sit in disbelief. Maybe you contemplate turning the game off, maybe you contemplate throwing something at your TV. It’s about one in the same at this point. The only solace you have now is that the powers that be had just enough mercy to spare you from seeing the lead change hands this inning with a strikeout by Corey Seager. One thing is for sure, this is peak Mets-ing. That, and baseball is stupid and irrational. 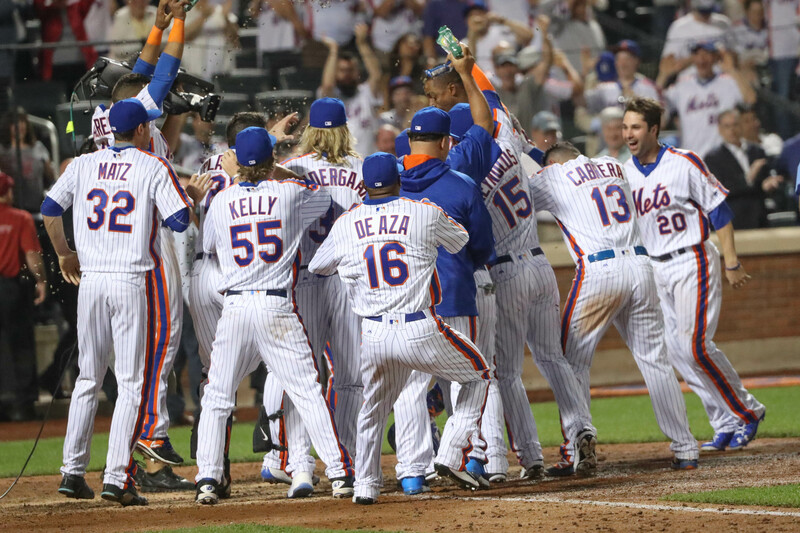 Amid sulking in what it truly means to be a New York Mets fan, something magical happens. The leadoff man in the bottom of the 9th is Curtis Granderson. To this point, he hadn’t had the best game. Having come to the plate four previous times, Granderson had struck out in three of them—which is not good. But you know what they say, 5th time is the charm, right? So you see that Granderson steps up to the plate, and all of a sudden the tables were turned. On the second pitch of the at-bat, Granderson homers to right field—sending Mets fans home happy. It was like an episode of Punk’d; only no one was prepared for it to be an episode of Punk’d. Surely no one pegged Granderson to play the part of Ashton Kutcher. Yeah, that’s what it was. Baseball had just pulled a practical joke on the Mets for a half-inning. That wily baseball, it turned cool just in time to totally redeem itself and give the win to its rightful owner. When it works against you, the irrationality and randomness of baseball can cause you to hate it. Think of your most hated moments as a baseball fan, and they’re probably the result of a game in which you had a reasonable amount of trust that the win was safe only to have your feet taken out from under you with an unforeseeable and random comeback. When it works for you, the randomness of baseball is absolutely incredible. It gives us the fluctuations in win probability we love to look at. It provides some of our favorite moments as a fan. Games like these are awesome, no matter what the end result is. They stick in your head and they remind you of how quickly a game that seems cut and dry can change on a dime. It is why we both love and hate baseball. Other than returning to a much more normal format for these recaps, the Mets will look to clinch the weekend series with a win on Saturday sending Noah Syndergaard to the mound against the Dodgers Kenta Maeda. Tomorrow is probably as good of a time to do this as any, because they will run into the man known as Clayton Kershaw on Sunday. At 28-19, the Mets lead the NL East by winning percentage, but are tied with the Washington Nationals for first place in terms of W-L record, so they will also look to take full possession tomorrow.